Earlier today I kind of had memories from what it was like when collecting Dino-riders toys are a major thing. That old place seems to be removed as of now. The thing I enjoyed most was seeing all the diorama's DR collectors made and had, there were some very cool ones around. So with this topic I am hoping to review a few of these collections, if not all and how they look like today. Earlier this afternoon I sent an email to Ted Neos the owner of the DR website, so he can update my old gallery there, kinda miss talking with Ted as well, he and I were friends since I was the first to have my collection uploaded to his website many years back. He really helped me complete my collection, also by helping me find missing pieces and such, but also talking about never seen before things and yeah I miss that a huge lot. 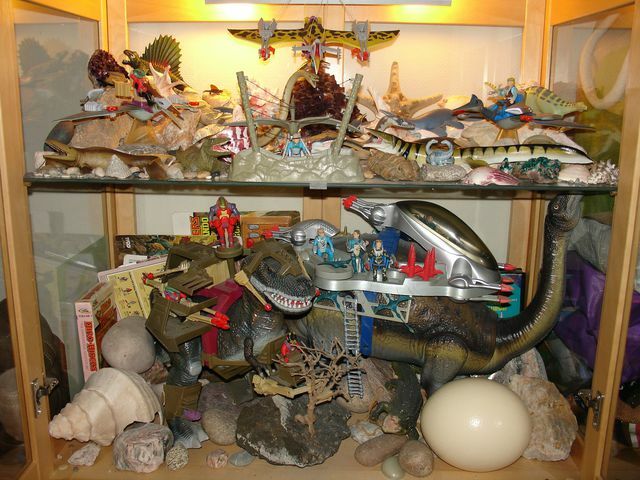 So with this thread I am hoping to bring back memories that us Dino-Riders Collectors experienced and what were your best finds during your collecting days of Dino Riders based toys? My best day was when I saved up 22 weeks for the Brontosaurus with Serena Ace & Ion. This is the one thing I will never ever forget and then other kids look at it as in wow did you just BUY that!!!! hah! Re: A look back to when collecting Dino-Riders was a thing. Woah, my greatest respect for that wonderfull idea and strong-willed and patient approach on buying that monster of a toy. There's definetly worse places in the world to collect garbage than WA beaches (been there, want to go again), but I can hardly imagine the ammount of cans one needs to collect to save up that much money. It was different and very original for it's time and that made it attractive for me , as a big fan of Star Wars & Dinosaurs it was a solution that offered best of both worlds ina single package. The dino toys them self look great when it came to DR series 2. The DR Kentrosaurus from DR Series 2 from 1988 was for it 's time the most accurate Kentrosaurus toy around and it stayed that for a very long time as well. I love these guys, still have them on display in my computer room, Valorians to one side and rulons to the other + a smattering of the tyco Smithsonian line and Cadillacs and dinosaurs to give them historical context. Still hate that I never got my hands on a brontosaurus or a pachyrhinosaurus, only two that I miss. Well I can always help look around for ya, Bronto's do come on ebay once ina while by Pachyrhino's is an other story, never say never though. Even I hope if they are going to make a new release of Dino Riders they better do it right like how the toys were in the 1980's mainly the second series but then with the accurate knowledge on how they looked from the knowledge of today. Thereby being a first Dino toyline using accurate dino's with the DR battle armor. The Rulons Kentrosaurus was from 1988 to 2015 the most accurate Kentrosaurus toy made, hereby mentioning it as a toy not a resin, even it being scale 1:24 I never took that too serious. All in all collecting these was a lot of fun and excitement and it's my first true collection of any kind of item and also my best. The saurolophus of Dino-Riders was the best figure of its kind until the arrival of Favorite saurolophus. Sincerely Dino-Riders made dinosaur figures quite nice especially in regard to ceraptosides and prehistoric mammals were very good until eighteen years ago I kept the smilodon, entelodon and megatherium but I gave them to a nephew of mine. They were quite good figures Dino Riders in general. Kentrosaurus was the best Kentro toy, accuracy wise for a very long time, if not still the best Kentro out there.